The DPF301 Series comprises 4 to 20 mA loop-powered panel-mount indicators that display process variables in engineering units (GPM, LPM, psig, %RH, etc. ), with an adjustable decimal point for rate and total display. Because these indicators take power directly from the current loop, the user can perform programming on the front keypad; there are no jumpers to configure or potentiometers to scale. An internal lithium battery ensures that all programming is retained in memory, even when the loop power is disconnected. 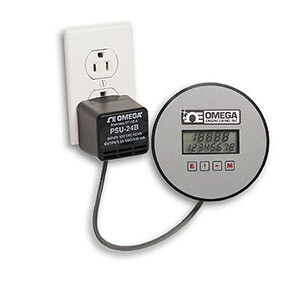 The DPF301 can be programmed for either a linear input or square root extraction for use with differential pressure flowmeters. The DPF301 general purpose indicator features one 41.2 digit rate display, while the DPF302 flow indicator has a dual, 2-line, 4½ digit rate display and 8-digit totalizer. The totalizer can be reset from either the front keypad or remotely via a contact closure. The DPF300 Series indicators are available in a choice of panel-mount, NEMA 4X (IP66), or explosion-resistant enclosures. Unit Descriptors: Gal, Lit, FT3, M3, "blank"
NEMA 4x housing for panel mounted 4-20 mA loop-powered ratemeter and totalizer for flow. For NEMA 4X polycarbonate enclosure, add suffix "-NEMA" to model number, add $100 to price. For explosion-resistant housing, add suffix "-EXP" to model number, add $305 to price.